In The First Emperor, Tan Dun’s music enters the listener’s ear like a mineral rich spring feeding a tranquil pond. To the complement of western orchestral instruments, Dun adds texture through several exotic instruments—the zheng, a Chinese zither-like stringed instrument; ceramic vessels struck with padded drumsticks, and the waterphone, a lantern-shaped vessel that is bowed like a violin. The waterphone, invented just over thirty years ago by a hippy in San Francisco, has been used in such films as The Matrix, Poltergeist, and Crouching Tiger, Hidden Dragon to create other worldly sounds. In the opening scene, fourteen players strike big drums with stones that they also clack together. Dun has his chorus stomp their feet and slap their thighs which he says was part of the musical culture in ancient China. Musicians in the orchestra pit chant Chinese phrases. Except for the emperor (played by world renown tenor Placido Domingo), most of the main characters have highly challenging vocal scores that require vocal gymnastics. Soprano Elizabeth Futral as princess Yueyang, the emperor’s only child, delivers aria after aria requiring such ornamented singing. 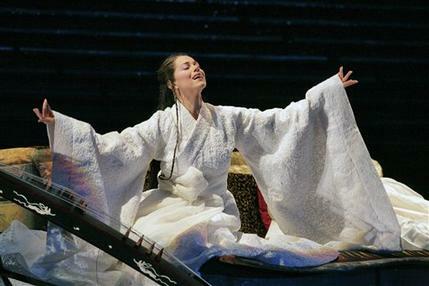 Despite her disability that keeps her from walking—she fell from her father’s horse as young child, she has a highly spirited personality that captivates everyone, especially her father who calls her “the sun.” The score Tan Dun has written for Yueyang seems entirely appropriate, but how many sopranos could deliver this character as well as Futral has managed to do? More curiously the composer has written ornamented vocal lines for Gao Jianli, the childhood friend of the emperor and the composer the emperor has commanded to write his coronation anthem, and for General Wang, the man the emperor has promised his daughter will marry. Both American tenor Paul Groves as the composer and Chinese bass baritone Hao Jiang Tian as General Wang deliver standout performances that in many ways rival the master Domingo. However, it is Futral who steals the limelight from Domingo with her magnificent mastery of her difficult score and her engrossing acting style. The libretto co-written by National Book Award winner Ha Jin with Tan Dun is filled with bright moments of poetic phrasing. For example, when Yueyang seduces the composer to choose life, she opens this “stubborn oyster” of a man with her “kissing soup.” However, on several levels, the libretto fails to provide a satisfying story. One particular problem is how the princess can suddenly walk after she had made love with the composer. Also, the listener is denied full comprehension of Qin Shi Huang, the warlord who unified and codified laws, measures, language and who became the first emperor through his tyrannical acts. Instead of presenting a fully dimensional emperor, the opera concerns a man who feels he cannot ascend to his throne without a proper anthem written by his unwilling childhood friend. The side story is his daughter’s struggle to choose her own husband. Her inability to get her father to agree with her becomes the First Emperor’s tragedy. Although we do not know if General Wang kills her for refusing to enter the bridal chamber or she commits suicide, just as we do not know if Wang kills himself or is poisoned by the composer, their deaths are followed by the composer biting off his own tongue and insulting the emperor who then kills the composer with a sword. Not until the end of the opera does Domingo have dominion over the stage. Of course, Domingo deftly pulls the work together and the tragedy is clear. Other characters of interest include Ying-Yang Master played by the agile Taiwanese dancer Wu Hsing-Kuo and Shaman played by American mezzo-soprano Michelle DeYoung. These two characters act as interpretive narrators and provide a certain Peking Opera inflection. The opening appearance of Shaman was overly slow and seemed to mirror Ying-Yang Master in a way that diminished the credibility of Shaman. Still, Shaman, with her long fingernails and oracular vision, provides engaging Chinese shading. Costumes by Emi Wada, sets by Fan Yue, and choreography and dancing by Dou Dou Huang all work well with what American audiences have seen of Chinese film director Zhang Yimou’s work, including his extraordinarily colorful recent film Curse of the Golden Flower. Zhang Yimou likes working on a grand scale and that comes through with the Great Wall of China set, the huge chorus standing on the steps of the Great Wall, the sumptuous costumes, the fiery but controlled dance of Huang.